Enjoyable local watering hole with really good bar fare. Great place to eat and play APC Poker! Good staff, quick service good food . Super place for gathering of friends, great food and beverage. We have mixed emotions about Dillons. The food is good but the bar prices are pretty high. Red Bull from the tap, over ice, was $5. Crazy! Nice bar and restaurant a little gem hidden away in this shopping center. Good food. Friendly service. Good food, good music, wonderful staff. This sports bar, and grill is by far my favorite. I have many good memories, and more to make. The food here is amazing as well as the atmosphere. The employees are awesome. Conversations are endless. Anne on the wait staff was awesome. Need more like her! Love this place! One of our favorites. Awesome spot. Great food, great service, great atmosphere. Daddy daughter date night, and with a live band! Enjoyable atmosphere. Comfortable. Was there for the open mic, which was great! Stretch is an excellent server!! Good music on weekends from the band. Decent food. Great staff. Fun spot. Best hot wings in the area hands down! Enjoyed the fajitas and chicken wings. 911 sauce is very hot so be warned! My husband and I like going to Dillon's. It's a sports bar and grill, do they have plenty of TVs, which pleased my husband to no end. Our food was delicious (wings for me and shrimp for hubby) and the service was great also. We will go again. Nice place to go get a bite to eat , relax and a drink and enjoy the live band on weekends . The live music is always good. New menu items worth checking out. Not just bar food... really good food sets Dillons apart. OK beer selection that doesn't change much. I came in with my boyfriend and best friend while in NOLA for a wedding. I definitely highly recommend coming here for the super friendly staff and for the cute atmosphere! They did a great job with my nails and did a great job with our friend's spray tans as well. 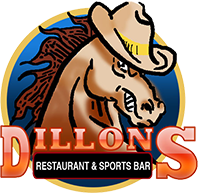 Dillions has been in the same location for over15 years. I think of it as a very local neighborhood place. They have lots of TVs for sports and one of the local card teams play there. The prices are reasonable and the food is not bad. Usually pretty busy on the weekends. A friendly group of regulars. A great place to be at. Cheers of the South. Wonderful staff. Positive atmosphere. Hot wings, tater tots and coldest beer around. I need to visit more.